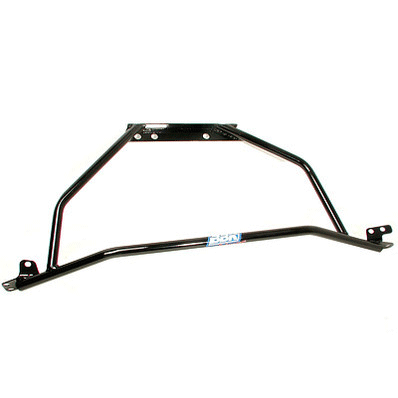 * Black Powdercoat Finish Mustangs have been notorious for having front end chassis flex since their debut in 1964. In 1995 Ford decided to help solve the problem on some Mustang models by installing a Triangular strut tower brace that helped join the flexing strut towers together and then join them to the firewall for additional strength. Only problem was they did not work with any aftermarket intakes, cold air kits and other engine mods. The robotically welded BBK Design is now available to fit all Mustang applications (except 99-04 Cobra) and fits with most engine modifications. Constructed from super strong tubular steel that helps strengthen the front chassis even more, these strut braces are available in Black or charcoal metallic powder coat or Chrome finish. Click Here for Instructions No one else can Stack up to the bold clean styling of our aftermarket Billet / Stainless Steel Dress Ups, Street / Strip / Racing Suspension and Performance Parts for your American Muscle Car! Fits these Vehicles: 1994 1995 1996 1997 1998 1999 2000 2001 2002 2003 2004 V6 V8 GT 4.6L 281 Mustang Roush & Saleen Vehicles. Does not fit 5.0L or 4V Cobra engines.